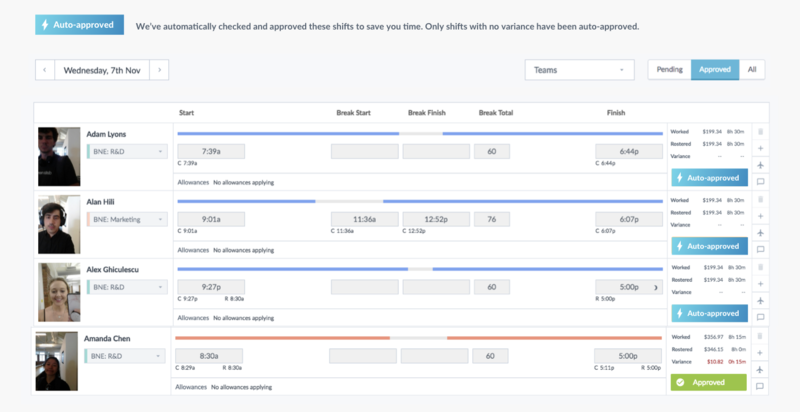 Shifts without variances can be approved automatically to save managers time when checking and approving timesheets. For new customers (starting Monday 21 Jan, 2019) Auto-approved of shifts will be on by default, and existing customers will need to turn the feature on. A shift will be auto approved when the rostered times match the clocked times i.e. where there is 0 variance. When viewing your timesheets any shift that has been automatically approved will have a blue button that says ‘Auto approved’ below the wage costs and rostered hours breakdown.